Looking for delicious ground turkey breakfast recipes that avoid common food allergies? I love one pan meals, especially for breakfast! The last thing you want to do in the morning is a lot of clean up. You can toss the potato and yam in the oven while you relax and enjoy your morning beverage or hang out with your family. Try this delicious recipe with turkey, yams and sweet potatoes. This is a filling morning breakfast with vegetables that your whole family will enjoy! Also great served with a little ketchup. Wrap Sweet Potato and Yam in foil and bake for approx. 30 min. Potato and Yam should be a little soft when pinched but still firm. Wrap Carrots in foil and bake for 15 mins. Carrots should be a little soft when pinched but still firm. Allow sweet potato, yam and carrots to cool while preparing the other ingredients. Start by dicing the yellow onion, place onion into a large frying pan along with one tablespoon of olive oil. Sautee onion on medium high heat for 3 to 5 mins. Until lightly golden. Add Turkey Meat into the pan along with the seasonings. Break apart meat and mix in with onion and seasonings. Allow to cook for 5 mins to brown and in the meantime dice Kale into small pieces, and toss into pan after the 5 mins of cooking the meat. Cook for additional 10 mins while preparing the following ingredients. Stir occasionally. Next remove the skin from the sweet potato and yam by peeling it off (should come off easily) and cube along with the carrots, add into meat mixture and cook for 10 mins. Your Healthy Breakfast is Now Ready to Enjoy! 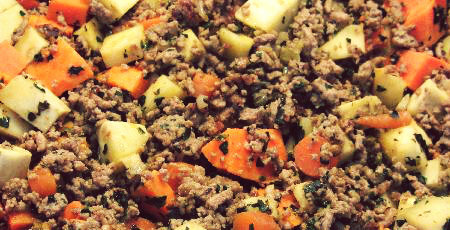 Return From Ground Turkey Recipes to Food Allergies Home Page!